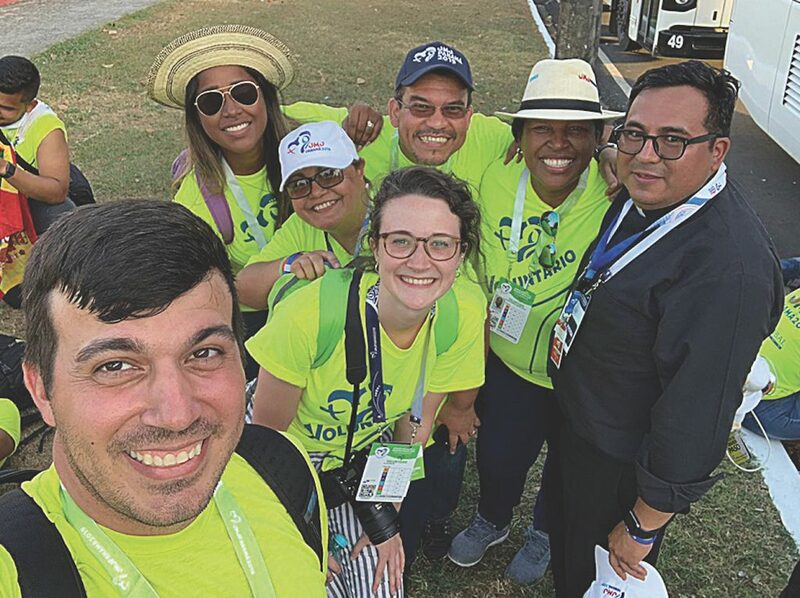 An aesthetically unbalanced selfie shows Leaven reporter Olivia Martin, center, and a group of World Youth Day press volunteers after Pope Francis’ meeting with the volunteers at Rommel Fernandez Stadium in Panama City. The other press members pictured came from Puerto Rico, Honduras, Panama and Mexico to volunteer. KANSAS CITY, Kan. — Volunteering at World Youth Day (WYD) was so different from being a pilgrim. When I attended WYD in Madrid as a pilgrim at 2011, it took me a while to get my bearings in a foreign country, surrounded by thousands of young people. As soon as I arrived, I had work, friends, a place to live and a community. I even had a parish — a spare conference room converted to a chapel in the international press center. Volunteering made me feel part of Panama instead of just a visitor. But the work of a press volunteer was less glamorous than some may think. There were many days I didn’t leave the press center until after dark. I missed the pope’s welcoming ceremony and the vigil. But we volunteer press became like family, and I was honored by the chance to help make WYD happen. I was even able to continue some of the work I had started in Kansas. In particular, I was finally able to meet a group of Pakistani Christians that I had interviewed and written about before even leaving home. I had written an article for The Leaven in December 2018 about “Samuel Sadiq” and six of his friends who were attempting to come to WYD in Panama from Pakistan. The men had tried and failed to obtain transit visas to Panama via the United States. But they managed to find an alternate route — from Pakistan to Turkey to Brazil to Panama. Originally, they were scheduled to depart Pakistan on Jan. 14. But when they arrived at the airport, they were detained by Pakistani officials and denied boarding. When I asked Sadiq why, he showed me his passport. Sadiq said because they were Christian, the authorities refused their passage. But as they say, the third time’s the charm — the men rebooked the same route for Jan. 18 and tried again. Once again, the authorities pulled them aside for questioning. “They detained us at Islamabad airport even after getting [our] boarding passes,” wrote Sadiq in a WhatsApp message. And that’s when Sadiq got an idea. He began recording a video in the airport, showing his passport and explaining he and his group were denied passage on grounds of religious discrimination. This drew the officials’ attention. They hurried to Sadiq and told him that he and his friends could board if he stopped recording and deleted the video, afraid that he might share it on social media. He stopped recording, but kept the video. And two days later, on Jan. 20, Sadiq and his Pakistani group landed in Panama for WYD. I met them for the first time on Jan. 22 after Pope Francis gave his opening address. Those words stuck with me as I met the Pakistanis for the first time. Here were people who reflected the pope’s words — they kept walking. Despite there being many superficial differences between being a WYD pilgrim and volunteer, my favorite part of both experiences remained the same: the people. And, like a true millennial, my social media choices manifested it. On returning to Kansas, I was searching for some of my best WYD photos to post on Instagram. I had captured amazing shots of the Casco Viejo (historic center), palm trees, sunsets and massive crowds waving their nations’ flags. I’d even managed to photograph the pope. However, I found myself coming back to aesthetically unbalanced photos of my friends. Everyone was sweaty, tired and wearing neon green “Voluntario” T-shirts — but their faces were some of the happiest I’ve ever seen. I realized that these friends weren’t my favorite part of WYD because of their happiness; it was due to who made them happy. To me, it was evident Christ was present in my co-workers, friends, those I interviewed and the articles I wrote. He arranged my rendezvous with the Pakistanis and my introduction to now-dear friends from Europe and the Americas. He sustains my desire to share with others the love these people gave me. This is the truest gift — to meet a love so great that it demands to be shared. And now, Christ asks me to be in Kansas to continue my work with The Leaven here. That is, until WYD Lisbon, 2022! Love your article, little sister! You´re one of our blessings of this WYD 2019. I hope to see you again, before Lisbon 2022!